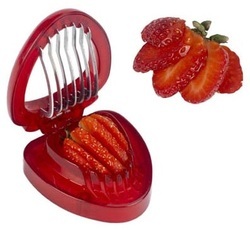 What a nifty new gadget - this strawberry slicer makes quick work in creating delicious summer desserts - only $4.95 at Uncle Ricky's! New Items in our Gourmet Goodies Dept! 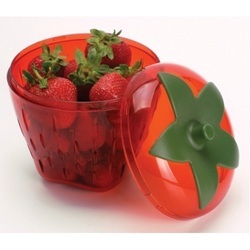 Keep your strawberries fresher in the fridge, with the Strawberry Fresh Pod! This ventilated protective pod can also be used to rinse, strain & serve - great for any type of berries & grapes! Just $6.95 at Uncle Ricky's! that make a hit at our parties. Check out our mixes for soups, dips, cheeseballs and more! We also had a great assortment of salsas, jellies and jams. And don't forget our dessert mixes & drink flavorings! 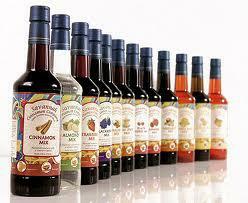 Drink flavorings from the Savannah Cinnamon Company have many more uses than just adding a little zip to your beverages! We have lots of suggestions for other recipes: desserts, snacks, side dishes and more! One of Kansas City's finest - this home-grown vendor offers a great selection of jalapeno fruit compotes, and Uncle Ricky's has a wide selection to choose from - samples are always available if you'd like a nibble to taste! Peach Berry, Pom Berry, Cranberry, Raspberry, Blackberry - all with a hint of jalapeno for a little zip! Great on cream cheese with crackers, on biscuits or scones, or serve as a chutney with your favorite meat! This is NOT your granny's jelly! Marinade your meats, throw it over cream cheese with crackers, even add a little excitement to your PBJ. These unique jellies and jelly rubs are made with bourbon, beer & tea bases, and are one-of -a kind! We spread it on thick at Uncle Ricky's - you're gonna love these! Just sayin'...we couldn't possibly be open without carrying the wonderful cheeseball and soup mixes from Wind & Willow! those of you that remember us from our American Homestead days probably have sampled these wonderful products! Rick can share any number of recipes for these treats that will make your next celebration a hit!